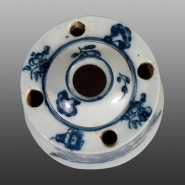 An inkwell of this shape, but missing its ink pot, was in the 1972 Caughley Bi-centenary Exhibition, no. 143 & plate 13. It too was printed with the Bell Toy and reverse print. The top of the inkpot, decorated with small floral prints. This rare inkwell has a removable central inkpot and the main body has four holes for pens. It is printed with an early Caughley pattern, the Bell Toy. A mug dated 1776, in the V&A Museum, is decorated with this print on either side. 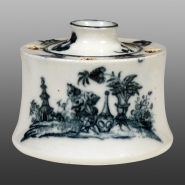 The reverse pattern used on this inkwell, showing a vase shaped object with a planted pot to either side, is also found with the Caughley version of the Mother and Child pattern. The mark was intended to be a "C" but it has been misapplied so that the serif, which is normally present at the top of the letter, is missing.